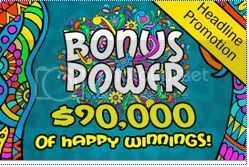 $90,000 Bonus Power Promotion At Jackpot Capital Casino. Take the Path to $90,000 Enlightenment at Jackpot Capital Casino! From September 21 all the way to a cosmic October 18, wander the Jackpot Capital Flower Power Commune and trip your way across deposit bonuses, free bonuses and free spins&#8230; And get down with fields of goodies. Swing into your hipsters and get $90,000 worth of groovy, baby! Climb the Turret of Happiness! Leap. Skip. Jiggle. Sing. Anyway you do it, fun your way up the scoreboard. Every week, there&#8217;s $15,000 for the players with the best vibes and the strongest energies. $15,000 every week just for chilling with all the fun you want. Groovy, baby! Every week $20,000 weekly random draw could wander your way! Let the love come to you. Become one with the world and lose yourself in the music -- the random weekly draw will happen with or without you. The more chill you are, the more it will follow its celestial path all the way to you. Deposit: Earn 1 point for every $20 deposited each week during the promotion. Play! Earn 1 point for every $500 in bets placed. Each week you could win these bonus awards! The more points you earn the more you move up in the rankings. Jackpot Capital Casino is powered by RTG Software. They always have so many new offers!